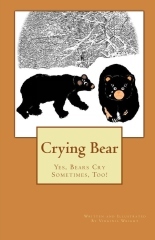 Being Retro: Crying Bear: Yes, Bears Cry Sometimes, Too! This is not one of my normal post here, this is a good thing... cause that means I am still growing and there is not always the need to shock you with my post. I was introduced to this book "Crying Bear: Yes, Bears Cry Sometimes, Too!" by my new friend and author Virginia Wright [BLOG] as we began to talk I was able to get her book. It's a wonderful little challenge learning book about... it's just okay. Description: Join this very adventurous little bear cub, as she wanders too far from the den in the snow covered mountains of Maine. About the Author: VIRGINIA WRIGHT is author and illustrator of the children's book-- Crying Bear, The Princess and the Castle, The Prince and the Dragon, and a non-fiction book titled Buzzzzzzzz What Honeybees Do. The Christmas Secret is targeted for release fall 2012. Virginia says she has found her love of words in children's writing; and spends her time writing from the Downeast area in the beautiful state of Maine. Wright says being a preschool teacher for a number of years at a private Christian Preschool and Kindergarten in Mississippi was definitely an inspiration for writing children's books, but the true inspiration for "Crying Bear" comes from her five grandchildren. Virginia Wright first became a published author in 1981 when she sold her first writing to a regional magazine in the state of Maine. She also had several of her writings published in an Anthology-- Soundings, by the Poetry Fellowship of Maine. She was quoted as saying, "When I am not spending time with my husband, watering my organic vegetable and herb gardens, canning, cooking, or feeding the chickens; I spend my time doing what I enjoy doing most, writing..."
I think it is a fantastic tale and I am happy to bring it to you... so did I shock you that I actually might be more normal than you once thought... give me an aweeee! Not worried one bit that you are normal! who is this Retro-Zombie? I want my old friend back. Just kidding. But the book sounds interesting. I commend Virginia Wright for taking on this intriguing project. Thank you for your comment about my book!!! Jeremy--You get an "aweeee" from me! Thanks for featuring my book on [Retro-Zombie].